Dr. Mark Richards uses JUVÉDERM VOLUMA™ XC and other dermal fillers to give patients a refreshed look without the need for surgery. 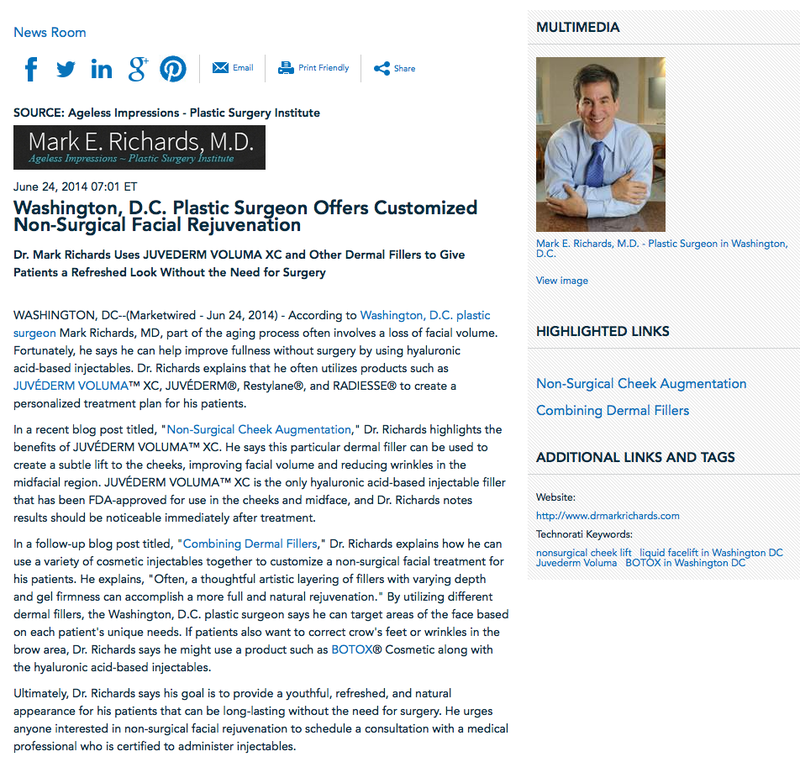 Washington, D.C. — According to Washington, D.C. plastic surgeon Mark Richards, MD, part of the aging process often involves a loss of facial volume. Fortunately, he says he can help improve fullness without surgery by using hyaluronic acid-based injectables. Dr. Richards explains that he often utilizes products such as JUVÉDERM VOLUMA™ XC, JUVÉDERM®, Restylane®, and RADIESSE® to create a personalized treatment plan for his patients. In a recent blog post titled, “Non-Surgical Cheek Augmentation,” Dr. Richards highlights the benefits of JUVÉDERM VOLUMA™ XC. He says this particular dermal filler can be used to create a subtle lift to the cheeks, improving facial volume and reducing wrinkles in the midfacial region. JUVÉDERM VOLUMA™ XC is the only hyaluronic acid-based injectable filler that has been FDA-approved for use in the cheeks and midface, and Dr. Richards notes results should be noticeable immediately after treatment. In a follow-up blog post titled, “Combining Dermal Fillers,” Dr. Richards explains how he can use a variety of cosmetic injectables together to customize a non-surgical facial treatment for his patients. He explains, “Often, a thoughtful artistic layering of fillers with varying depth and gel firmness can accomplish a more full and natural rejuvenation.” By utilizing different dermal fillers, the Washington, D.C. plastic surgeon says he can target areas of the face based on each patient’s unique needs. If patients also want to correct crow’s feet or wrinkles in the brow area, Dr. Richards says he might use a product such as BOTOX® Cosmetic along with the hyaluronic acid-based injectables. Ultimately, Dr. Richards says his goal is to provide a youthful, refreshed, and natural appearance for his patients that can be long-lasting without the need for surgery. He urges anyone interested in non-surgical facial rejuvenation to schedule a consultation with a medical professional who is certified to administer injectables. About Mark E. Richards, M.D. Dr. Richards is a Yale graduate and certified by both the American Board of Plastic Surgery and the American Board of Surgery. He is a member of the American Society of Plastic Surgeons, and he has been elected by his peers as President of the National Capitol Society of Plastic Surgeons as well as President of the Montgomery County Medical Society. Dr. Richards is available for interview upon request. To learn more about Dr. Mark Richards and his practice, visit drmarkrichards.com, facebook.com/drmarkrichards, or twitter.com/MarkRichardsMD.